For some reason my daughter doesn't like mushrooms and she 's a kid who fancies fish heads and goat bone marrow. I keep trying different recipes with a hope that someday I will be able to convert her. The good thing is she is always open to trying new recipes and tasting different ingredients. I recently saw a video of a Chef demonstrating a recipe of mushrooms and black fungi in an unusual combination of Indian spices. I wanted to try and taste it for myself but had only mushrooms on hand. I still went ahead and was very pleased with the final result. Though my efforts to make my daughter enjoy mushrooms still continue. The Shahi jeera /caraway seeds used enhances the earthy flavor of cremini mushrooms to a greater degree. Know more about this unique spice here. 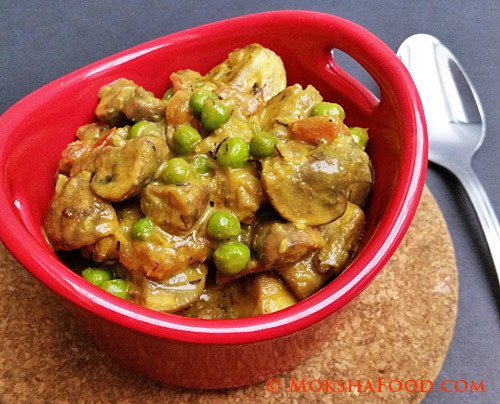 This is an easy recipe which tasted quite different from usual Indian curries. This is a classic example of letting only one spice dominate the flavors while the other ingredients balance it. 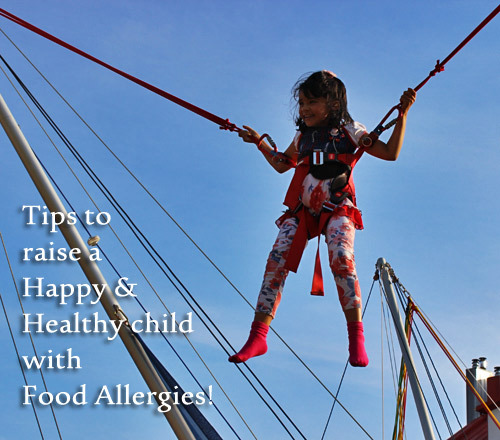 Tips to raise a Happy and Healthy child with Food Allergies! Parenting has never received as much attention as it has in our present age. It was usually limited to the elders of your family taking cues from their own experience and giving you some tips. But today Parents realize that raising a child is not an easy task. The issues faced because of the changing social habits and climatic conditions we live in cannot be related to our previous generations. If raising happy and healthy kids today is a conscious effort, raising one with allergies is even more so a challenge. Allergies not only affect children physically but the side effects also have deep emotional bearing. We all want to raise happy and healthy children. But each child is unique and needs to be catered to individually according to his/her personality and needs. Here are some issues I dealt with and how I found my own resolutions. Hope it helps you in some ways. Tom Yum is the most popular soup in Thai cuisine and enjoyed for its spicy and tangy flavors. But the lesser known Tom Kha is equally delightful. This soup is unique with galangal and coconut milk dominating the flavors. Its primarily served as a seafood soup with some variations in Thailand made with Chicken or pork too. You could use a single fish or a mix of different sea foods to make this recipe. If using fish, you could either fry the pieces and then add to the soup or poach it in the fragrant broth. The fish is usually removed and cut into small pieces for serving. I prepared this recipe more as a curry to be served with rice. I used an entire White Bass fish chopped into steaks along with its head, as my daughter enjoys fish heads. She does have a peculiar food preference. Chickpeas or Garbanzo beans are the most favorite legumes at my house and we eat it at least once a week. I have fixed 3 mandatory vegetarian days for my carnivorous family. Chickpea days are happier days with no complaints. They are a good source of vegetarian protein and minerals. I cup of cooked chickpeas are known to contain about 15gms of protein and 12gms of dietary fiber. They are a high source of Iron (26%), Folate(71%), Manganese(85%). Usually I make chickpeas either in the Punjabi style or in Middle Eastern recipes. This time I tried it with coconut masala gravy. 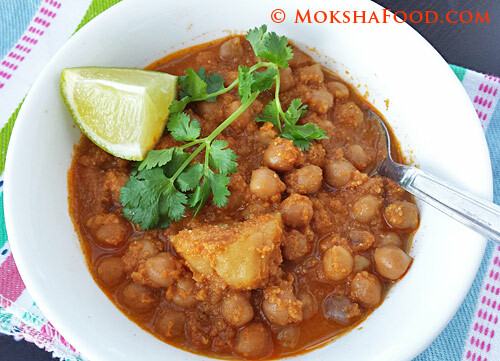 Its a simple, easy recipe and complimented the chickpeas very well. The Jaggery lent out a mild subtle sweetness and depth of flavor to this curry. Potatoes may be an accompanying side for most meals in the west but in Indian cuisine it can be the Star of a meal. From everyday meals featuring aloo subzi (potato stir fry) to decadent Aloo Dum (baby potatoes cooked in a rich sauce). Its the most beloved vegetable with variations being made in every household of India. Potatoes are one of those items which are a must in your pantry even for those days when your refrigerator is empty. 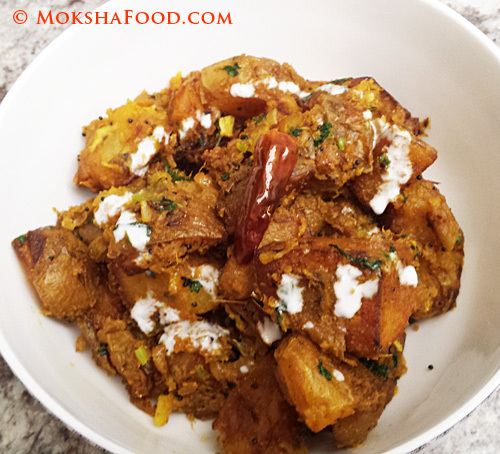 Bombay Aloo is a stir fried potato recipe which taste delicious with even minimal spices. Potatoes are boiled first and then stir fried with spices. This double cooking ensure potatoes are soft and soak in the flavors really well. This is a quick and easy recipe which is a favorite at home as well as Indian restaurants. Since the time I got heavily addicted to this Asian Cooking Show, "Luke Nguyen’s Greater Mekong" on Gusto Channel, the herb - dill has been ruling over my kitchen. After using dill to flavor Yellow Moong dal (lentils), vegetable stir fries and salads I still had some portion of the bunch left. This time I experimented with red meat. Mutton or goat meat has a strong taste and needs rich spices to flavor it through. I used my staple Indian spices for goat curry and added a bunch of dill leaves. 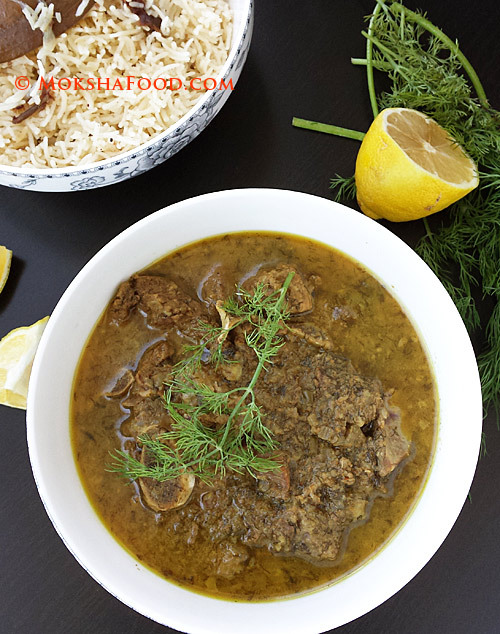 The lemony flavor of dill leaves and yogurt brightened up the mutton curry with a tangy twist. We slurped up this delightful mutton dill curry with date rice pilaf and lemon wedges. Paneer Makhani is a restaurant favorite loved by Indians and others. 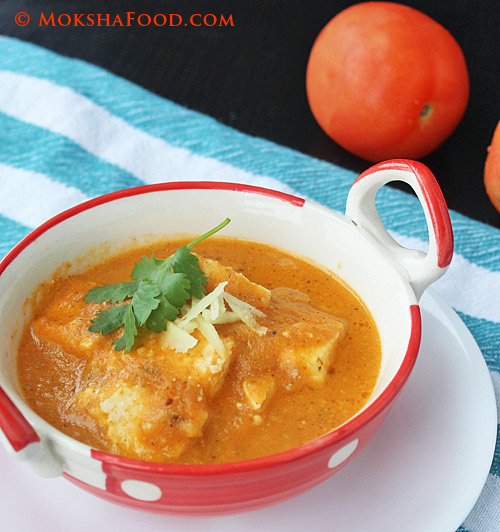 Cottage cheese cubes simmered in a buttery tomato cream sauce and flavored with mace and cardamom. 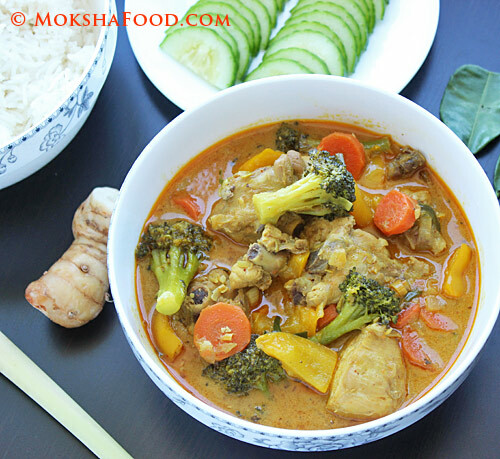 Its one of the delicately flavored recipes which seems difficult to replicate at home. This is an easy version that I have adapted from this recipe of Chef Harpal Singh . The key ingredient is a new spice I got to work with - Mace. Mace is nothing but the dried up outer covering of nutmeg. 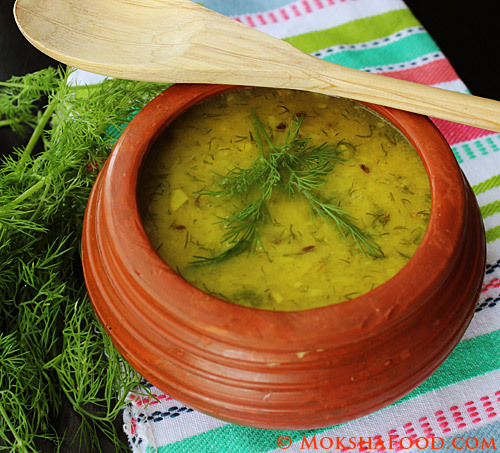 It is generally used to flavor Biryanis or Rice pilafs. The spice is very strong in flavor so less is more. Some more info here. 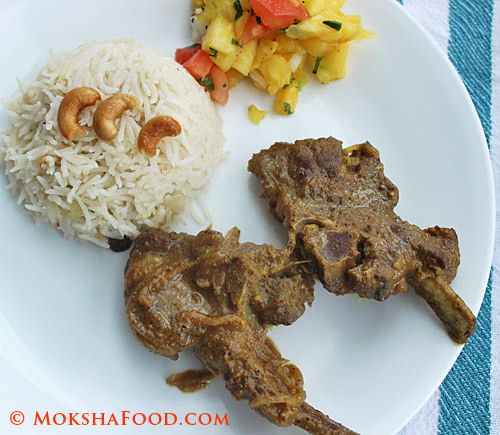 My Introduction to Mutton/ Goat meat was post my marriage into a Bengali family. 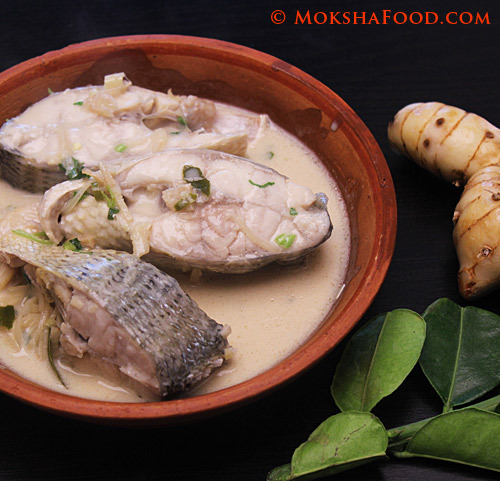 Bengali's are predominantly non-vegetarian with river fish and goat meat as their main staple. Goat meat also forms an integral part of their culture. From the ritualistic sacrifices done during Kali Puja to every Sunday meal prominently featuring a goat curry. They have been traditionally known to frown upon chicken and other meats. And so the tradition of making Goat curry every Sunday has continued at my home too. During a recent grocery trip, my husband chanced upon freshly stacked mutton chops at the meat counter and was surged by a flood of childhood memories. After school and college, he would pick up a couple of freshly grilled mutton chops from the street vendors and chomp on them as he made his way home. Last few weeks I have been hooked onto this Asian Cooking show "Luke Nguyen’s Greater Mekong" on Gusto Channel. It showcases the beauty of rural Asia along the Mekong river which spans many borders and brings to light some of the indigenous recipes. The most interesting part of the show is the chef lays out his stove and starts cooking almost anywhere - in the paddy fields, on mountain tops, at the side of the road, under a waterfall. This really goes to prove that you don't need an elaborate kitchen with latest gadgets to cook good food. Just the freshest ingredients and the love of food is enough to churn out the best meals. There was something so alluring about cooking under the open sky that I was sorely disappointed to live in an apartment with no means to cook outdoors. But this summer I plan to head out and try outdoor cooking at least once for the love of food and adventure.